You will see different unique business ideas popping up when in Manila and let’s face it: consumers are not just looking at the services that businesses offer us anymore, but also at how business owners retain us. Unique corporate giveaways can help validate our worth. It’s a different scenario for business owners, though. They have to carry the burden of looking for these corporate giveaways to offer their customers that that will, at the same time, carry their brand and bridge the right thought to go with it. Corporate giveaways are not just given on holidays anymore, either; they are given anytime as long as there are valued customers to please. Fortunately, these promotional strategies no longer need to be a dilemma for purchasing, marketing, advertising and PR professionals; business owners; event managers; wedding planners; or anyone who needs to provide creative gifts to consumers. Now on its 27th year, Corporate Giveaways 2014 showcases more than 80 participating companies with over 120 booths of promotional strategies in the form of advertising specialties, awards, medals and trophies, bags, and wallets, travel and storage essentials, balloon decors, caps and headgear, CEO gifts, Christmas giveaways, corporate neckties and uniforms, desktop accessories, organizers, handcrafted items, housewares, leather craft, gadgets, mobile accessories, personal care products, food and beverage packages, writing instruments and much more. Branding is important, but thought is still sought-after. Let’s face it: consumers are tired of getting giveaways (like umbrellas) that bear a big logo of the companies that give them to us. Sometimes, it simply makes us feel like we are meant to turn into walking advertisers for them. And who wants to feel that way? At the event, I realised that businesses really do need to incorporate branding in all of their promotional strategies. However, it is also important to consider how our consumers will feel about our giveaways. The exhibitors and WorldExco owners: (L-R) Malou Castro (Oriental Merchants), Apple Caballes (Storage Solutions), Raquel Romero (Pres. of WorldExco), Rachelle Enriquez (Langhoff) and Bogee Romero WorldExco). We don’t really need to give out overly decorated items with our logos or brands on them. Instead, we should aim to give our consumers what they really need while making them feel cared for. In today’s technologically-advanced environment, consider the fact that most people would end up with a ruined day if their phones run out of battery on a busy day, but won’t feel too bad if they left their umbrellas at home on a hot afternoon. Which giveaway would you appreciate more? There are many ways to innovate branding. It’s a nice thing to know that business owners are not required to join bandwagons of any kind. Thanks to World Exco 2014, business owners will get the chance to sit down with creative people who can provide them with innovative ways on how to brand themselves in a new way. Imagine the gap you can place between you and your nearest competitor towards your customers. Fruits in Bloom. Edible fruit arrangement as corporate giveaways instead of flower arrangements. Branding is all about practicality and uniqueness. Most business owners are aware of the importance of branding for their business. It isn’t about overly sized logos on items without any rationality behind them anymore. Corporate branded giveaways don’t have to be expensive just to send a message to customers, either. Instead, they should be practical – things that can be used in everyday life yet are still unique enough to make your customer look at them in awe. Some of the corporate giveaways of the exhibitors. Don’t underestimate what corporate giveaways can do for your business. To business owners, they may just be momentary tokens to be given out, but to customers, they may send out appreciative and long-lasting messages that make them feel worthy. Simplify your life and find what you need by visiting Corporate Giveaways 2014 at the SMX Convention Center on July 9-11, 2014. 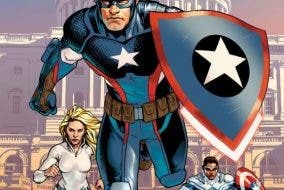 Is Captain America Really a Villain Now?